Around the world, wildlife trafficking in animals and natural resources is a major security threat and environmental risk. Jessica Graham is a former contract expert for Interpol, and currently president of JG Global Advisory, an environmental security consultancy in Washington, D.C.
Mongabay talked with Graham recently to get her perspective on the threat convergence of wildlife trafficking and organized crime. When it comes to the multi-billion dollar global illegal wildlife trafficking market, security experts note a “threat convergence” where trafficking and organized crime meet. Because of that convergence, trafficking in illegal natural resources is a major security threat and environmental risk. Illegal wildlife trade includes a huge range of natural – often forest-rleated – items from endangered animals to exotic and illegally-logged wood. Mongabay caught up with Jessica Graham, a former contract expert for Interpol, and current president of JG Global Advisory, an environmental security consultancy in Washington, D.C.
Mongabay: Why has wildlife trafficking become a global security threat? Jessica Graham: Wildlife trafficking is a lucrative criminal activity. For example, rhino horn fetches more than gold or cocaine on the black market in destination countries across [Southeast] and East Asia. We’ve also seen evidence that militant groups, such as the Lord’s Resistance Army, operating across Central Africa have traded in ivory due to its low risk of detection and high reward potential. Just like any legitimate enterprise, criminal entrepreneurs are seeking to make a profit. And illicit wildlife products are – unfortunately – profitable. We need to reverse this equation. Finally, the U.S. is a major consumer market of illegal and legal wildlife products — largely reptiles and exotic birds for the accessories and pet trade. The U.S. Fish and Wildlife Service employs nearly 250 special agents across American ports, but that unfortunately is not sufficient for the amount of illegal wildlife goods being exported and imported. Where does illegal logging fit into the equation? Illegal logging is done largely by industry on a massive scale that is decimating habitats for whole species such as orangutans in the Sumatran forests due to palm oil extraction of massive palm fields. On the issue of wildlife trafficking, are things really that bleak? I would say the issue is pretty bleak, but we’ve been down this path before in history and have succeeded in reversing poaching trends through innovative solutions and community-based conservation efforts. There are glimmers of hope. For example, tiger populations in the wild for the first time in 100 years are making a comeback where they have previously been critically endangered. The conservation and law enforcement communities have made strides to reverse poaching trends in certain parks in recent years. As an international community, we have very few successes that we can point to as far as the end goal is concerned — reducing or eliminating poaching and trafficking of wildlife and the increase in specific species populations. We must act now, the urgency is to act now to end the illegal wildlife trade because these are finite resources and we don’t have that luxury of time. Are there any notable success stories in combating trafficking? Nepal has seen near zero poaching in its protected areas, but that is largely due to its militarization, which is cause for concern for many. It’s a dangerous step to take when equipping and replacing park rangers and other police officers with the role of a military. Additionally, communities and law enforcement play a critical role in ending the poaching issue at the local level and the trafficking issue across borders. Then there is Botswana. It is home to the largest population of African savanna elephants and just last week saw nearly 90 elephants poached. Botswana was thought in recent years to be a success story of securing its borders against poachers, but we are now seeing this country have challenges with poaching, which I would surmise may be coming from the balloon effect or possibly because the government made a decision to disarm the park rangers earlier this year. What are some of the issues with limited verifiability of seizure data? Wildlife trade data of seizures must be specific, reliable and verifiable. Many countries differ on tracking and reporting specific wildlife seizures. There is a lack of adequate, verifiable controls, and while there is the CITES, the international agreement among governments to regulate international trade, countries adhere voluntarily, which provides for limited enforcement by CITES and a wide and varied spectrum of engagement by the member states. Unlike the drug trade, where a seizure is clearly illegal if it’s cocaine or marijuana, for example, the trade in wildlife is not so black-and-white for law enforcement. Ivory may be traded within a country’s borders legally, but internationally if it’s dated after 1989 it’s illegal to trade across national borders. For law enforcement, this poses an additional layer of complexity to enforce and capture seizure data. 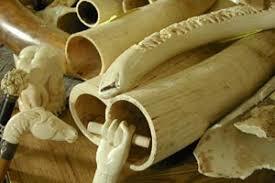 Illegally trafficked elephant tusks. Credit: USFWS. Many customs and border officials may see a piece of pangolin scale, for instance, and let’s say the (false) CITES permit states that it’s something else and that it is legal and then it goes through the border or port. A seizure is one data point or indicator, so for example, an increase in ivory seizures doesn’t necessarily mean that law enforcement and customs officials are increasing their role in conducting seizures, it could possibly mean more illegal products are flooding the ports due to an increase in poaching and consumption, among other reasons. Data is very important to identify trends in poaching, declining species populations, and the impact law enforcement may or may not have in assisting to reduce trafficking as well as informing policymakers and enforcement. But it’s also critically important to look at many factors when assessing data and drawing conclusions. What would an intelligence-led policing approach to combating wildlife crime look like? Intelligence-led policing is built around assessing and managing risk. It’s imperative that the collection of intelligence that is gathered by law enforcement serves as a guide to operations and not the other way around. It entails a proactive approach rather than a reactive approach to crimes, including wildlife crime. While working at Interpol, I was part of a team that assisted countries in developing interagency task forces to collaborate, utilize a small group of law-enforcement-only officials working on a specific case and trusted partners in other countries that we could work with on the reliable information that we received. It’s critical to have the human analysis of the data and information that we received to transform it into actionable intelligence. We ensured there was follow-through at the country level together with the police services and judiciary’s ability to arrest, prosecute, and convict wildlife criminals. International organizations, such as the U.N. Office on Drugs and Crime (UNODC) are working with countries to ensure they are enforcing resolutions that were adopted where wildlife trafficking as a serious crime so that law enforcement can utilize international cooperation tools, such as mutual legal assistance and joint investigations across country borders. Having served as a chief negotiator during my tenure at the U.S. Department of State, we worked with the international community to pass several of these environmental resolutions in the United Nations. The role of the internet has been significant in trafficking in what ways? The role the internet now plays is significant in a globalized world where we are all connected and frequently trade and purchase products online. Criminals are also looking at the online marketplaces as a platform to sell and purchase illegal products, including wildlife products. Many companies are signing up to alert their customers that it’s illegal to purchase certain wildlife products and have set up zero-tolerance policies on their sites. Unfortunately, that is not sufficient to deter buyers and sellers of illegal wildlife products. Last summer while working for Interpol, I co-hosted a workshop with the conservation NGO the IFAW (International Fund for Animal Welfare). We brought together policymakers, tech companies and law enforcement to share best practices on cyber-enabled wildlife crime that was to feed into enforcement guidelines for wildlife investigators. This is a novel approach for law enforcement who are in need of assistance for cybercrime investigations on the illegal wildlife trade. Often, wildlife investigators do not have the resources, expertise or training to conduct extensive cybercrime investigations for illegal wildlife products. I was also part of a project previously that looked at the use of the dark net on the illegal wildlife trade. The report found that there was not much [wildlife] trading on the dark net compared to other illicit products such as drugs, counterfeits and fraudulent documents. The open internet is still the main route for criminals trading online in illegal products. How does Interpol plan to share its enforcement guidelines to assist law enforcement investigators globally? At the CITES Secretariat Standing Committee meeting that I attended in Geneva last December, a cyber wildlife crime working group was set up with a number of member states, NGOs and international organizations to discuss and share challenges and areas for cooperation in this (newer) area among the working group.